Sunrise Marine Enterprise is a renowned organization engaged in trading and exports of Marine Equipments in Bhavnagar, Gujarat, India. 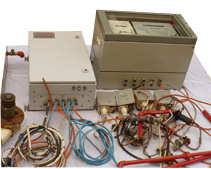 We have been providing professional services, expertise and support in the field of Marine Digital Electronics -Navigation Equipment , Safety and Survival Equipment (Life Saving) and Fire Fighting Equipment for Marine and Offshore Industries like Gyro Compass, Radars, Furuno, JRC, Sperry Marine, Tokimec, Koden, Kelvin Hughes, Anritsu, Consilium, Anschutz, Navtex, Echo Sounder, GPS, Autopilot, Speed Log, Weather Fax, Course Recorder, VDR & SVDR, Anemometer, Sonar,Liferafts, Lifeboat, SCBA, Lifejacket & Buoya, Fireman outfit,Main Engine, Auxiliary Engine, Turbo Charger, Purifiers, Compressor, ODME, PV Valves, Cargo Hoses,. Navigation Equipments available to meet the requirements of every type, size and class of vessel, including high speed crafts, wether it's new or a retrofit - Anschutz, C Plath Navipilot, Comnav, Hokushine IPS, PILOTSTAR - D, Robertson AP9, Simrad, Sperry, Tokimec, Tokyo Keiki Gylot & Yokogawa. Supplier and service provider for All Marine Automation, strong team of highly qualified and experienced professionals from the Industry to meet your complete Marine Automation requirements. 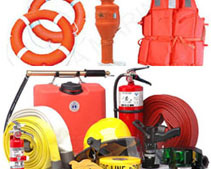 Exporter and Supplier of Life Saving Equipments, Life Guard Equipments, Life Jacket, Life Rafts, Breathing Devices (Self Content Breathing Apparatus), Life Buoy, Life Saving Hook, Fire Suit and Fire Fighting Equipments from Bhavnagar, Gujarat, India. 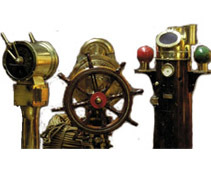 We have wide Collection of Marine Antiques such as Telegraph, Steering Column, Binnacle's Compass, Chronometer, Miniature Binnacle, Bell, Telescope and various Copper and Brass Latern's. 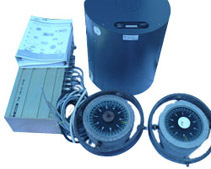 Supplier and Exporter of Marine Navigation Equipments, Refurbished USED Marine Electronics, Marine Radars, Marine Gyro Compass, Marine Electronics Navigation, Autopilot, MARINE AUTOMATION, TANKERS SPARE, LIFE RAFTS, MARINE SAFETY, GPS, NAVTEX, VDR, ECDIS, BNWAS, COURSE RECORDER, ECHO SOUNDER in Bhavnagar, India. Subject to Bhavnagar Jurisdiction...@ 2012 Sunrise Marine. All rights reserved. Tagged by WEBS INDIA.